Did the ancient Maya come to north Georgia and carve a record of an ancient cosmic catastrophe on a giant boulder there? That is precisely what the latest research published today reveals. The giant boulder in question is known as the Forsyth Petroglyph. A petroglyph is simply a rock featuring engraved designs. First discovered in the early 1800s, the Forsyth Petroglyph currently sits in front of the Anthropology Department at the University of Georgia. For nearly two hundred years the enigmatic designs on the boulder defied interpretation. Yet over the past few years the petroglyph has started to give up its secrets. It was first noted back in 2004 that the designs looked astronomical in nature and that the boulder could represent a star map. This was the first attempt at interpreting the boulder. Later research supported this theory when it revealed two of the designs on the boulder were identical to the constellations Draco and Scorpio and an “incomplete star symbol” likely represented a supernova. This research also revealed that several other symbols likely represented a comet which broke up into several fragments. Such an event really did occur around 536 AD thus the petroglyph was theorized to have been created sometime after 536 AD as a record of this event. The latest research supports the previous research that the petroglyph represents a record of a comet breakup and impact event around 536 AD. Yet this research has made some startling revelations. First, this latest research revealed that two Mayan symbols can also be found on the Forsyth Petroglyph. The first symbol is identical to what the Aztecs called Cipactli and the Maya called the Cosmic Crocodile. Cipactli was represented by the Aztecs as the decapitated head of an alligator. In Mayan mythology, the Cosmic Crocodile was decapitated which led to a massive flood. According to hieroglyphic inscriptions in Temple XIX at the Mayan site of Palenque in the southern Mexican state of Chiapas, this decapitation and flood occurred around 3300 BC. This is about 200 years before the end of the previous Mayan calendar cycle. Interpretations of this myth have shown that it records the breakup of a comet whose fragments slammed into the world’s oceans spawning mega-tsunamis that destroyed coastal civilizations of the time. Physical evidence in climate, geologic and ice core records prove that such an event really did occur in 3300 BC precisely when the Mayan inscriptions said it did. Thus the appearance of Cipactli, the Cosmic Crocodile, on the Forsyth Petroglyph is not completely out-of-place. Both represent records of impact events. More importantly, these inscriptions include a Mayan glyph that also appears on the Forsyth Petroglyph. According to these inscriptions a “god” was “enthroned” in the sky eleven years before the comet impact event. Research has shown that this Mayan account of a “god” being “enthroned” in the sky was a record of the appearance of a supernova in the sky. Since most stars are always in the sky only a supernova would be described as being “enthroned” and coming to power. Since supernovas are often much brighter than other stars, sometimes even visible during daylight hours, it seems reasonable they would be considered “king” of the stars and their sudden appearance described as an “enthronement.” More importantly, physical evidence in the Antarctic ice core reveals that a supernova likely did occur around 3300 BC when the Mayan inscriptions say it did. Thus again, there is physical evidence to support the myth. Coincidentally, the Mayan glyph for “enthronement” is identical to the “incomplete star symbol” on the Forsyth Petroglyph interpreted to represent a supernova. Thus again, we have another Mayan symbol which is used in the correct context on a petroglyph boulder in Georgia. So how would a depiction of Cipactli, a Mesoamerican symbol for an ancient impact event, and the Mayan glyph for “enthronement” appear on a petroglyph in north Georgia? Curiously, the inscriptions in Palenque’s Temple XIX were recorded around the same time as the Forsyth Petroglyph. Murals in this temple also recorded the visit of foreigners to Palenque. Could traders from Georgia have visited Palenque and brought back this Mayan story of an ancient cosmic catastrophe? It has been noted that one of the largest sources of the clay used to create the important Maya blue pigment is located in Georgia. A local source for the Maya blue found at Palenque has never been found thus perhaps these visitors also brought a few bags of this clay with them from Georgia? More importantly, could a similar catastrophe occur at the end of the current Mayan calendar? 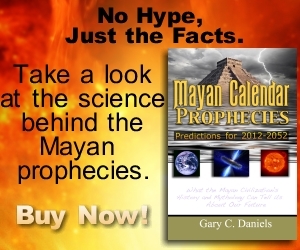 According to research published in the book Mayan Calendar Prophecies, the most dire Mayan prophecies were not for 2012 but for the time period between 2032-2052. In fact, these prophecies sound remarkably like the prediction of an impact event. Eerily, NASA is currently tracking several asteroids that have a chance of impacting during this time period. One, named Apophis, has the potential of causing major global disruptions to civilization. As physicist Neil De Grasse at the Museum of Natural History in New York has warned if this asteroid slams into the Pacific Ocean it would produce waves of mega-tsunamis that would blast clean the west coast of North America. It would do the same to the east coast of Asia and Australia. Could this be a repeat of the Mayan accounts of the events that occurred near the end of their last calendar cycle?